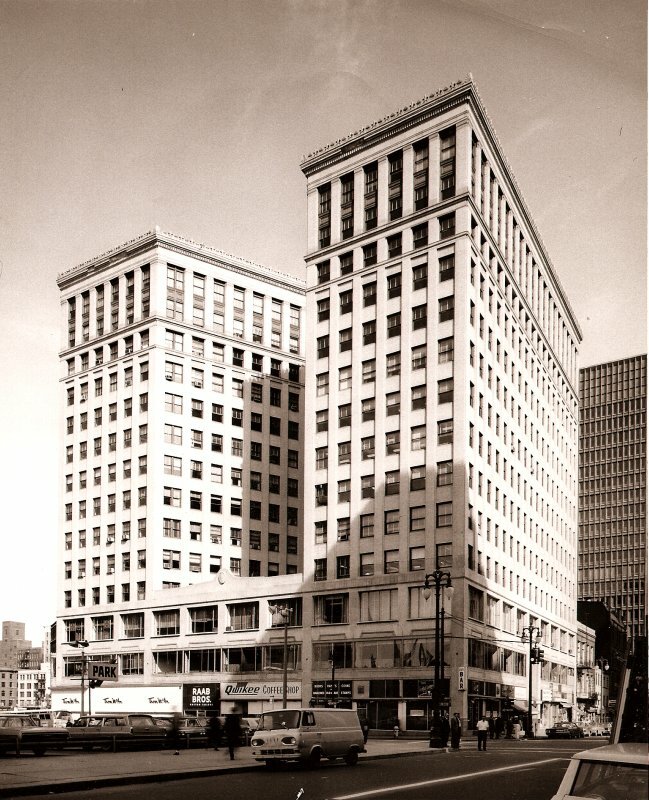 A vintage shot photo of the Lafayette Building that I found on City Bird Detroit. Original photo source and the building's history is on Buildings of Detroit. As if not to be outdone by Monday's vote by St. Louis' Preservation Board to demolish the San Luis, yesterday the Detroit Downtown Development Authority voted unanimously to demolish the historic but vacant Lafayette Building. One would think that with its location literally in the shadow of the beautifully restored Westin Book-Cadillac and nearby Fort Shelby Hotel & Apartments both recently opened after years of abandonment and decay, that the DDA would see the natural potential of the Lafayette? Sometimes people here wonder if St. Louis is striving to be like Detroit with our seemingly never ending wanton destruction of urban fabric. Unfortunately this week it seems that Detroit is striving to be like St. Louis. Last night after more that three hours of testimony including about 30 citizens, organizations and a developer speaking out against demolition of the San Luis, 28th Ward Alderman Lyda Krewson stood before the Preservation Board and gave her blessing for a parking lot. 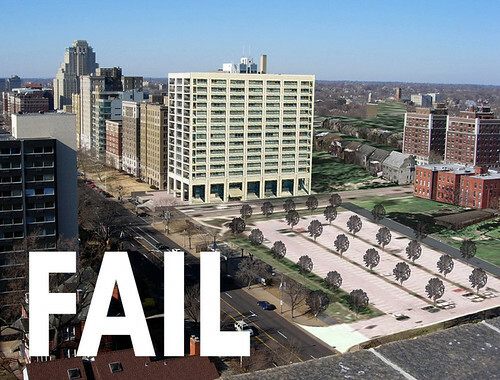 While Lyda acknowledged that a parking lot is not the highest and best use of the prime site at Lindell and Taylor, she stated that because the Archdiocese does not want to sell the San Luis that she would rather not see it standing vacant. Instead of asking the full board if a motion could be heard, Preservation Board Chairman Richard Callow (a friend of Krewson) asked board member and 7th Ward Alderman Phyllis Young for a motion. Young of course following the tradition of aldermanic courtesy, presented a motion to support the request for demolition. David Richardson seconded the motion and argued that the outdated ordinance for the Central West End historic district excluded the San Luis. When the vote was called, Anthony Robinson and Melanie Fathman voted against the motion. Chairman Richard Callow broke the tie with a yes vote for demolition. John Burse and Michael Killeen, two board members who are architects and typically vote for preservation were unfortunately absent, as was vice chair Mary Johnson. Ultimately this battle is not simply about a building. It is about a City's willingness to stand up and exert control over it's built environment, promoting a vibrant urbanity that will attract and retain residents or to allow an unrestrained free for all in land use and development like so many faceless suburban waste lands. It is likely that a citizen appeal to last nights decision will be filed by the Friends of the San Luis. The Preservation Board meets TOMORROW, June 22nd to consider the Archdiocese request to demolish the San Luis at Lindell & Taylor. If you have not done so already, please email your letter or comments to the Preservation Board Secretary Adonna Buford. Please copy your letter/comments to 28th Ward Alderman Lyda Krewson, and Monsingor Gardin at the Archdiocese of St. Louis. 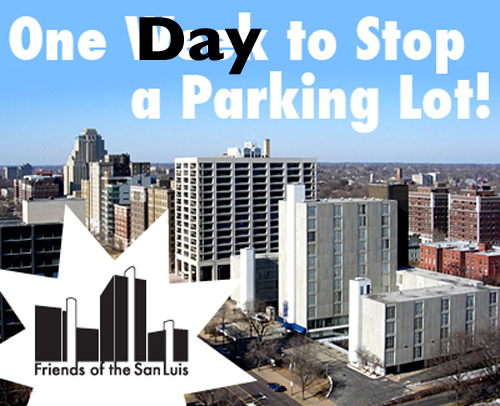 For more information check out: noparkinglotonlindell.com, the official blog of the Friends of the San Luis. The northwest corner of Kingshighway and West Pine is empty except for some trees and parked cars, contributing little to the urban environment fronting Forest Park. 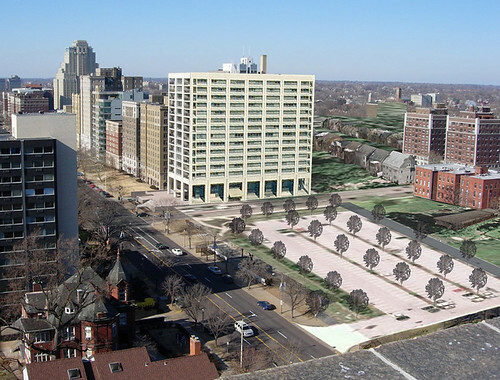 Starting at BJC's Queeny Tower at Barnes Hospital Plaza just north of Highway 40, substantial buildings march up Kingshighway culminating with the iconic Park Plaza at Maryland Avenue, giving that stretch of the boulevard a kind of Central Park West feel. The notable gap in this row lies between West Pine and Lindell with surface parking lots occupying two prime park front parcels. This was not always so, at least at the northwest corner at West Pine. 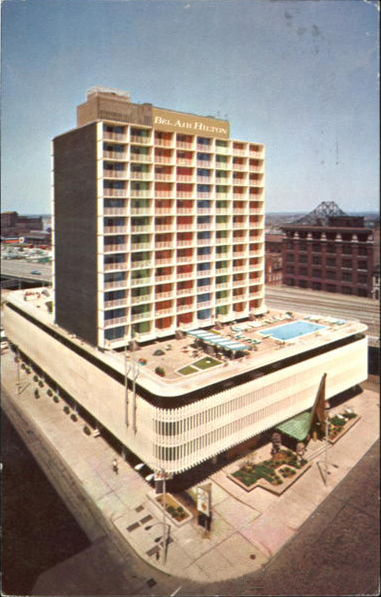 This site was once occupied by the Buckingham Hotel, also known as the Ambassador Hotel. The U-shaped hotel rose seven stories above Kingshighway with repeating bay windows around the wings to take advantage of great park views. Thank you Lindsey Derrington for the Sanborn source and photos above. 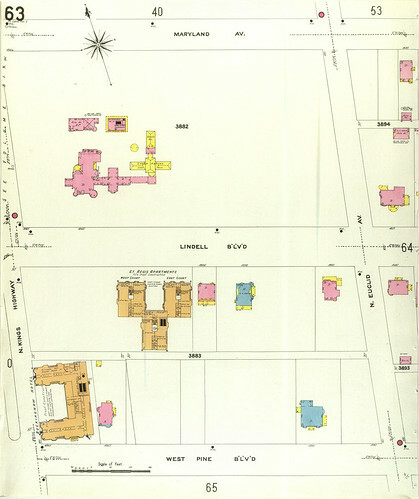 I am unsure of the Buckingham's date of construction, but it shows up on a 1909 Sanborn map, along with the nearby St. Regis. 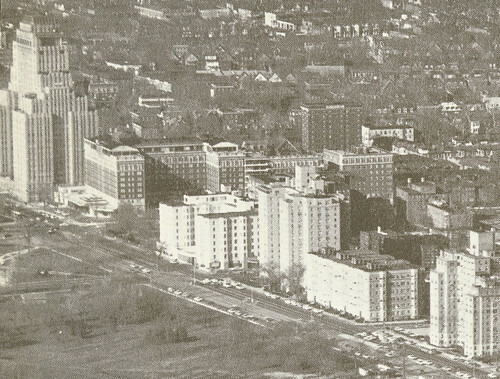 Construction of the nine story Chase Hotel, Chase and Chester Apartments on Lindell was still 13 years in the future. The Buckingham was likely unable to compete against the opulent Chase Park Plaza to the north and was converted to small apartments. 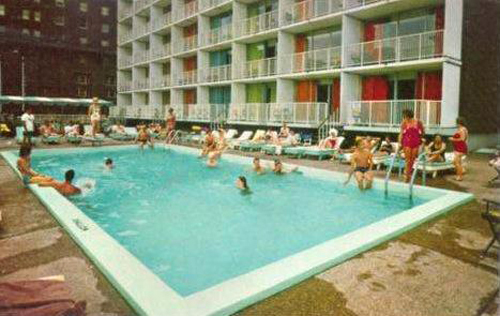 The Ambassador as it was known in later years was demolished sometime around 1973 after a fire. Parc Frontenac immediately south. Photo from "This is Our St. Louis". I'm, not sure if the land was immediately turned over to surface parking, but 36 years later, that is all we are left with. The property is now owned by the Parc Frontenac apartment tower, which fronts Forest Park across West Pine. I know that in the 80's there was a proposal to develop this lot and the Koplar Properties lot on Lindell with a large mixed use complex, but this never came to fruition. 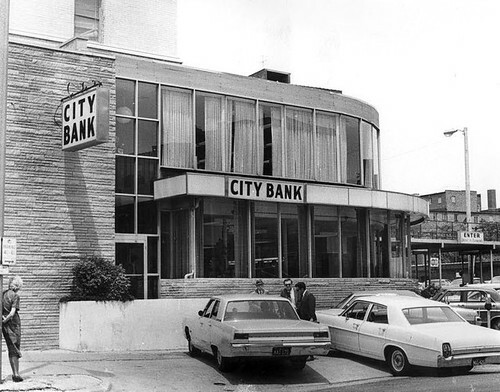 City Bank branch has also been demolished for surface parking for the St. Regis. As the Archdiocese of St. Louis now contemplates demolishing the San Luis at Lindell and Taylor, creating a large gap in the urban streetscape of Lindell Boulevard we must ask ourselves as a City: Is this acceptable? Will we still be stuck with another surface parking lot 36 years from now? The Preservation Board will meet next Monday June 22nd to consider the Archdiocese request to demolish the San Luis at Lindell & Taylor. The board takes into consideration letters, comments and emails that they receive from citizens when they make their decisions. YOU can help prevent an new surface parking lot in the middle of one of St. Louis' most vibrant neighborhoods. Please email your letter or comments to the Preservation Board Secretary Adonna Buford. Please copy your letter/comments to 28th Ward Alderman Lyda Krewson, and Monsingor Gardin at the Archdiocese of St. Louis. If you would like to present your comments in person, the Preservation Board meeting is at 4:00 P.M. on the 22nd at 1015 Locust, Suite 1200. There are several items on the agenda before the San Luis, so the meeting may be long. More information about the issue including a sample letter that you can borrow and modify (if you are unsure what to say) can be found at noparkinglotonlindell.com, the official blog of the Friends of the San Luis. Last Saturday, I attended a picnic under highway 70 near where it crosses Washington Avenue, cutting of Downtown from Laclede's Landing and the Arch Grounds, creating a mile long dead zone. I was facing the lower levels of the Hampton Inn which fronts on Washington. 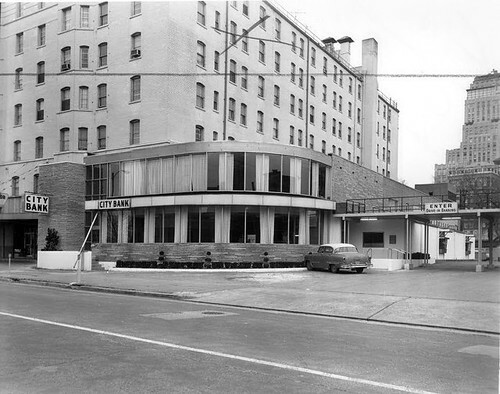 After the picnic, a friend and I were walking up 4th Street and I was lamenting about how the Hampton Inn used to look when Trader Vic's was there and before the building was re-muddled and completely re-faced with Styrofoam and fake stucco. someone had the bright idea to replace all of these with the cobra heads that everyone hates. I have heard that the Granitoid poles were thrown in the river. 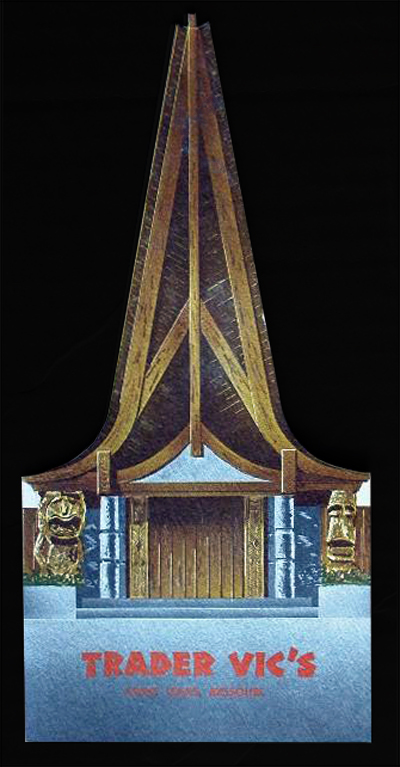 That night I searched online to see if I could find some images of what I remembered from childhood... and found these photos from an online forum about "classic & modern Polynesian Pop". Yes, such a forum actually does exist, and thankfully so. The building was much more stunning than I remembered. 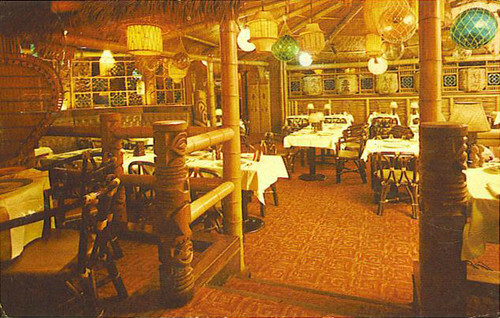 I remembered the base with Trader Vic's and that was about it. 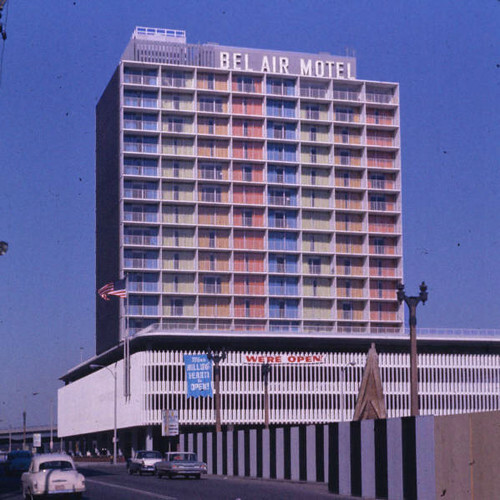 The Bel Air East, which was completed in late 1962 was a great example of the tower on a podium concept that was popular in the Modern era and executed in a manner unequaled anywhere in St. Louis. My friend commented that it looked like it was straight out of Florida, and with good reason, because there simply was nothing else like it here in St. Louis. Sadly in 2001, the year which had been immortalized as the ultimate "future", the hotel was bought by an operator who lacked vision, who then hired an architect with even less vision. Instead of capitalizing upon what was there, they foolishly tried to take the building into the past, attempting to emulate the tripartite classical revival structures farther west on Washington such as the Renaissance (former Statler) and Renaissance Suites (former Lenox) hotels... and doing a poor job of it. Even worse, they spent a lot of money to ruin this building, $14,000,000 according to the City's website. While in 2001 the Bel Air's age was only 39 years old, eleven short of the typical age of eligibility for listing on the National Register, a building can be eligible for listing if it is considered of "exceptional importance". In 2004 the brutalist style Pet Milk Building several blocks south of the Bel Air was listed on the National Register at the young age of 35. If the developers had chosen restoration, they could have been eligible for both state and federal Historic Rehabilitation Tax Credits totaling 45% of eligible costs. Instead of creating a hip trendy hotel catering to the creative class, like say the soon to open Indigo Hotel on Lindell in what was the Bel Air West, we ended up with one that looks more like a place that over the hill conventioneers go to hibernate. Unfortunately this rare example of Mid Century Modern was lost. Will we lose another one at Lindell & Taylor? 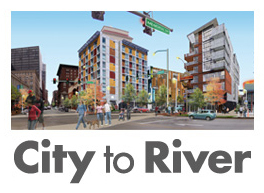 YOU can help determine the future of the Central West End! Step 1: Plan to attend the St. Louis Preservation Board meeting 4:00 P.M. Monday, June 22nd, 1015 Locust Street, Suite 1200. Sign up to speak to the board. Tell them why another surface parking lot is the last thing the Central West End needs. Here is the board agenda for the meeting. Step 2: Write the incoming Archbishop, Robert J. Carlson: 4445 Lindell Boulevard, St. Louis, MO, 63108. He will be installed this Wednesday, June 10th. Ask him to re-consider the decision to demolish the San Luis. Remind him that his residence is catty corner to the proposed parking lot. Please copy Alderman Lyda Krewson: City Hall, Room 230, 1200 Market Street, St. Louis, MO, 63103 or email Lyda.